Well after church and a rainy afternoon this past Sunday we headed to goodwill and my fianc? says would you be interested in this. A woobie for $6.27 I said oh yeah. Great find sweetie. Dumb question - what is a "woobie" ? Looks like a sleeping bag to me ? Jack Butler: I understand that you little guys start out with your woobies and you think they're great... and they are, they are terrific. But pretty soon, a woobie isn't enough. You're out on the street trying to score an electric blanket, or maybe a quilt. And the next thing you know, you're strung out on bedspreads Ken. That's serious. I gonna guess this has morphed in to todays use as anything meaning warming, security, or comforting....Hence the poncho liner. My kids dog has Woobies and Wooblies. It is over my head. Flea market in town today and since we were going in to pick up a check for some things that were consigned at the local gunshop I stopped by. I got the following from one vendor. Three packs of Wonder Lube BP revolver wads, 4 tins of percussion caps (2 no. 10 and 2 no.11) a box of .454 round balls and a box of .451 round balls, and a one pound bottle of Pyrodex 3F. (I don't use Pyrodex any more but 3f will shoot in a BP revolver just fine and for what it cost I will use it). All for $25.00. Pretty reasonable price for what you say. At least that is the way I am thinking anyway. I reload & although not in the market for supplies lately... That is a good deal from my side of the river. The absolute best deal I have gotten in a long time was a couple of weeks ago at a Bushcraft meet that we held at an area State Forrest, there were about 25 more or less people attending and as usual we had a trade blanket set up, a new member was setting some stuff on the blanket so I wondered over to take a look, he had some mics. items and two vintage '70's era Coleman fuel two burner stoves. I love those old Coleman stoves and lanterns, I asked him if they worked ok, he said he didn't know, he bought them at a flee market figuring if one worked he'd have the other for parts, but he never got around to trying to light them, I asked what he wanted for them and he asked if I could use them, I told him that I have a few and use them allot, but that I liked working on them rescuing the vintage ones. So he says, if you can use them, take 'em, I offered to pay for them and he refused, he said I was doing him a favor by taking them, he said "When I left the house this morning my wife told me that what ever I do, don't come home with those old things". I guess I don't have to say that I didn't mind helping him out at all, a few days later I dragged them out of the truck and gave them a try, one lighted right up and worked like new, the other had a problem, after cleaning and oiling the pump parts and checking the tank pressure, I took the generator apart and cleaned out the tube and spring, and used a torch tip cleaner to ream out the hole in the brass generator tip and that did the trick, it fired right up and worked great. One of them is in very nice shape, the older one by a couple of years needs some sanding and paint, but will be a nice little winter project. I guess you can't beat "for free" Moe. That was a great deal. Thanks Stan, you're right there, but I believe that when you do something nice for someone it usually comes back to you in some way, I've been paring down a lot of my stuff for a while, while some of it is worth a few bucks it's usually easier to gift it to someone who can use it and in some cases can't afford it. A few weeks ago while cleaning up in my basement I ran across my Browning compound hunting bow, I bought it just before Browning got out of the bow business, I didn't get to use it much after pulling a muscle in my shoulder, it was in a new hard bow case with sights, quiver, and 18 new arrows, one of my sons is a bow hunter so I gave it to him. I don't intend on doing any more tent camping, but I have a nice baker tent by Panther Primitives, and a big Museum Wedge by The Tentsmith in NH. with a bell on the back that's like new, along with some other camp gear that I'm not using, another of my sons is into Civil War reenacting, so I stopped in to see him and told him to pick the stuff up, while there I spotted an old Grumman aluminum canoe in back of his house, he said he had just got it back from his ex, it had been at their place on a lake. He said he hadn't used it in a long time, I told him if he ever wanted to sell it to let me know, I have been looking for another canoe for a while, he said if I wanted it to take it, call it an even swap for the tents, if he needed it he could always borrow it from the old man. So now I have a decent canoe to clean up over the winter that will be ready for spring, things do have a way of coming back to you when you help others once in a while. They don't say "you reap what you sow for nothing" Moe. Karma or whatever you want to call it does happen. Machete with 12" blade is marked "Ontario U. S."
My wife got this one for me this weekend and I was initially underwhelmed. Knife was dirty, has plastic finger guard, rubber scaled, dirty nylon sheath, etc. when I cleaned it up a bit, I realized it is a Gerber Watson-Harsey Silver Trident. Wan'na double your money real quick, Sarge? LOL. I'll keep you in mind, wolfy, if I decide to cash out. You guys have so many great finds. Mg buddy is the same way at Milsurp stores. He dogs through piles and comes out with gold. I have found a few good deals at pawn shops, but no steals by any stretch. Just bought a genuine Hudson's Bay 6 point(queen sized) wool blanket for $10. That shoots way up my list of best bargains I've ever scored. Great score Wannabe! Defitenly a good find. Yeah, I know how lucky I was. I consider myself a wool fanatic and own a few point blankets already. I actually had to think twice about buying it because I already have many others that never see use but as a fanatic, you can't say no. I also picked up an English made, queen sized, 100% merino wool blanket at a church rummage sale last year for $4. It is pristine and so soft it makes a Hudson's Bay blanket look like a horse blanket. I wish I had some sewing skills because I would love to be able to re-purpose them into garments and other things I would use daily. 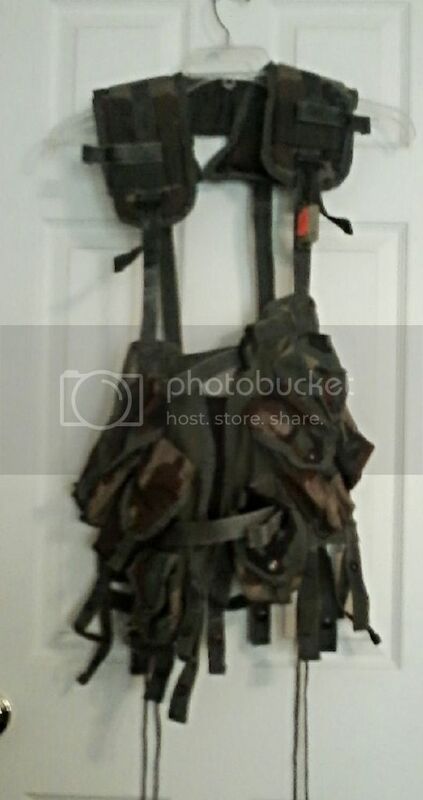 Got a USGI Tactical Load Bearing Vest (Enhanced) in woodland camo, in excellent shape....$5.00!! My cellphone camera doesn't do the camo justice! I got a down parka for $15, a nylon fronted fleece vest with loads of pockets for $5, polyester long johns and top for $15 and a brushed polyester work shirt for $4 the week before last at Value Village (second hand clothing store). Im not a big Coleman Lantern guy but I bought two functioning lanterns at a yard sale for $5.00 each. One of them was the Red Ted, the Ted Williams model from the 60's made of stainless steel. They sell on eBay for about $100-$150. Ive got one of those red coleman ones,missing the glass,when my mom sold the house this past summer i found a brand new glass in a box,took it home and promptly broke it when putting it in the lantern sigh!!!!! The Red Ted is a double mantle lantern with a red top and polished stainless tank and frame. I also have a red Model 200 which is a single mantle lantern with red top and tank. I know what you mean about the globes, though. I bought a Dietz original USA Kerosene wick lantern with an original red glass globe on eBay. It arrived a week late and the globe was broken. Being that is was standard shipped by eBay, it had no insurance. I had to spend the cost of the lantern to buy and ship a modern reproduction. I was not amused. Well hit the antique stores today, the wife was looking for some vintage crystal knobs that weren't found. I did happen to find a few things of interest. Not a bad way to spend $38 bucks. I did manage to get some Awesome books. I've got that Blacksmithing book, greyhound......wort h it just for the pictures of the old tools! That book had me talking with the owners of the store and it was the wife's fathers book. I told them I was interested in blacksmithing someday and always looking to gather some of the materials especially an anvil. Long story short I might be getting my hands on an anvil with some history. He does know they have a RR track anvil that he would sell cheap if he could get it back from his brother. Fingers crossed! I haven't flown in about 15 years. Not that I'm opposed to it.....just didn't have any place I felt like going. Got a trip coming up in less than three weeks, so when I stopped by a yard sale today and saw a large Samsonite and carry on Samsonite - both with wheels - I jumped on them for a total of $10. Gret deal Dave. I've always considered luggage a once in a lifetime purchase. It's expensive new, but if you get good quality stuff, it will last you a while. Sounds like you got an excellent deal. I used to think that, too. I can't tell you how many 'unsinkable' Samsonite and American Tourister luggage pieces I bought for Heather while she was on the road every week......the airlines can destroy ANYTHING! . One especially nice and EXPENSIVE piece lasted ONE TRIP! For $10 if they survive one trip to Hawaii I'll be happy. I'd better not even tell you what happened on our Hawaii trip then! Man, they gotta be tough if you jumped on them! If I jumped on any of our luggage, it would be a case of picking up pieces! Creek, is that a Kellogg? If it is, it looks almost exactly like the one we had at the farm. Party lines, BAD pole & line maintenance, rubbernecking neighbors, zero privacy and more, made trying to communicate with the old relic nearly futile. We had no options until around 1962 when I was in the 8th grade & the dial system became available to rural areas. 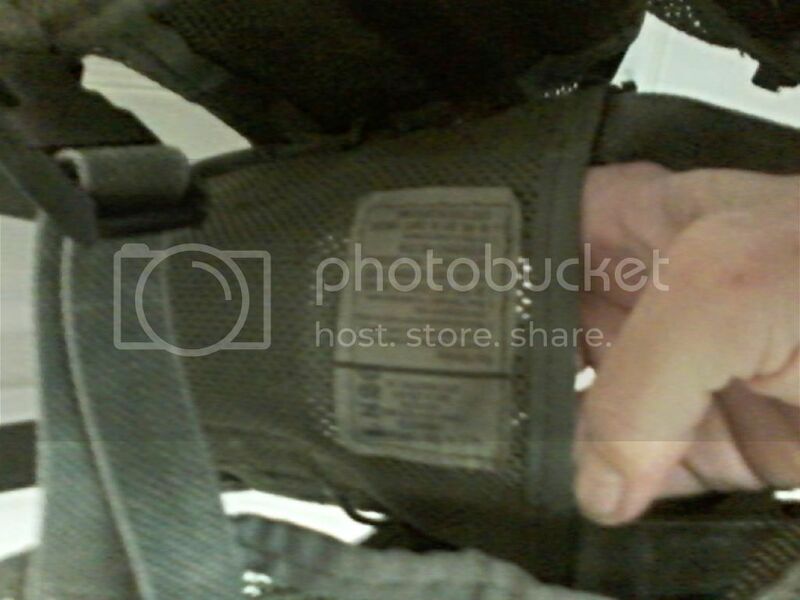 Could you possibly take some close-ups of the reciever and hand piece......maybe a couple more detail shots? Great memories! Thanks! Very cool find, UTC! And right reasonable price too! Anyway... Pretty good decoration on the wall! Most of the old hand-crankers around here relinquished their guts to the clandestine fishing industry. It's a repro. Has a dial works in it. It does have a tag and I'm going to get the info. It's Hello Control. 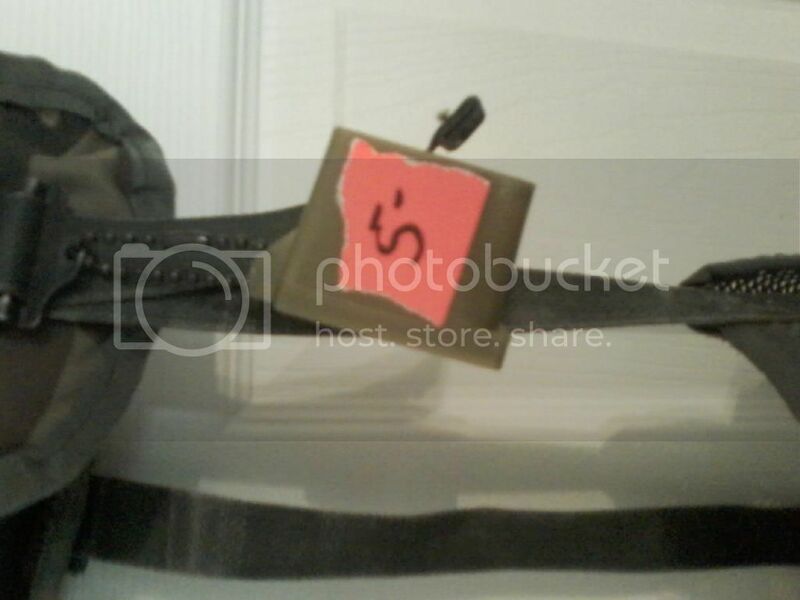 Serial # is 5-63-243. Seems hard to search for info on this for some reason. I like it though. My baby does too. That's a good thing. Today at the local railroad/truck salvage store I got a shaving mug, soap, boar brush, and brush/razor stand for $6.00. My old Gillette safety razor fits right in. That frees up my other boar brush so I can break the handle and take the boar bristles out and epoxy a few of them into a drilled deer antler to use as a brush for my flintlock.